Photos by David Norwell, identification by James Miskelly. 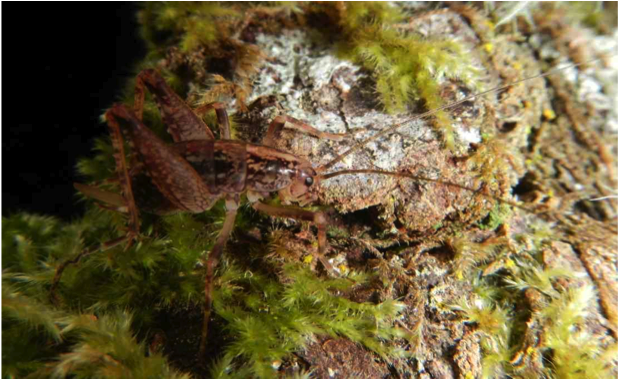 This cricket has a tan to brown body with variable patterns, and measures 10-50 mm long. It has a distinct hump-back with very long antennae and long legs. It has no wings and is therefore unable to chirp like other Orthoptera species; it also has no hearing organs. 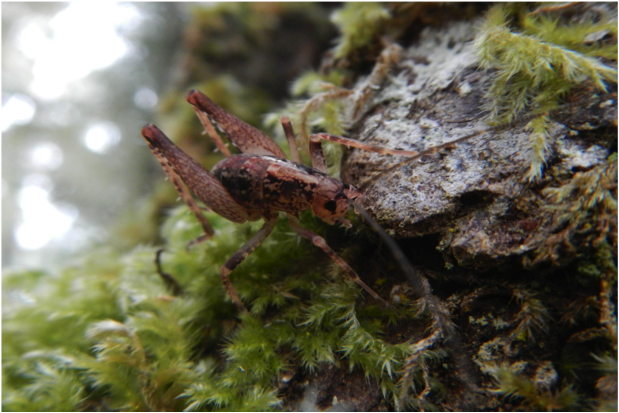 It has 4 segments on its tarsi (feet - see definition here).They are without wings and therefore unable to chirp like other Orthoptera species. 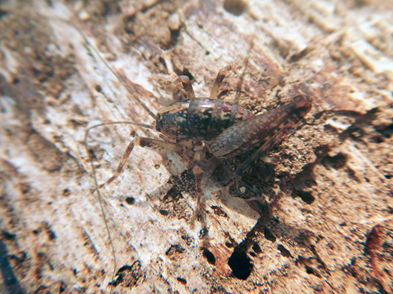 The camel cricket was only recently documented north of Vancouver Island It is also known as the “cave cricket” as it commonly spends time in dark places. It can be found behind bark on dead trees, in cavities under roots, and in crevices in rocks. This primarily nocturnal species can be hard to find. The camel cricket has lost some of its ability to see because of its nocturnal nature. It is an omnivore and feeds on most organic material as well as some small animals. On Vancouver Island the camel cricket is known to infest cool, damp, and dark areas of houses, where they may chew on paper products and fabric and become an unwanted pest. National Audubon Society.(1980). Field guide to insects and spiders. Alferd A. Knopf, Inc. Species Pristoceuthophilus celatus. BugGuide. Accessed 12/12/2014. David Norwell, Kelly Fretwell, and Brian Starzomski (2014).